Please note that the cruise terminal is quite a distance from actual Muara town where the container port is located. The terminal is about 25km from Bandar Seri Begawan. The ships transfer to Bandar is around 40 euro. The local bus near the port for $2.00 SGD - will also take you there (just the like the ship shorex). It's about an hour. You get to see all the local towns/villages whatever on your way in - very interesting trip. Check the bus schedule for your return trip. The cruise center has a range of amenities including a restaurant, a cybercafé, a foreign currency exchange booth, a souvenir shop and a recreation room. 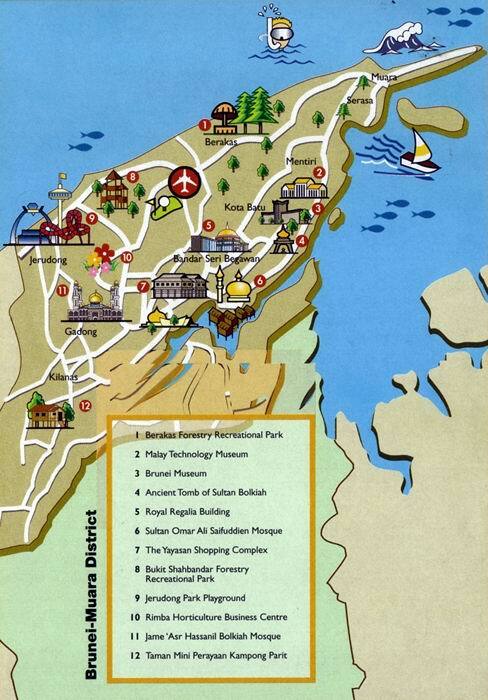 Bandar Seri Begawan (usually called BSB or Bandar) is the capital of Brunei. The center of BSB lies at the confluence of the Sungai Brunei and Sungai Kedayan and is compact enough to explore in about an hour on foot. One of the most impressive things in the whole country is the Omar Saifuddin Mosque. At night it's particularly stunning with green lights illuminating the dome, casting a pleasant reflection in the pool below. it pays to take an extra pair of socks as no shoes are allowed on the marble floors. They are very strict on this and no shorts for the gents and ladies have to cover up. Something not to miss if you like all that is gold and glittering is the free Royal Regalia Building, a museum of the sultan's treasures. You can see the sultan's coronation regalia as well as a myriad of gifts presented to His Majesty by various heads of state. If you are interested in seeing a water village, take a river taxi (not expensive if you share one) to Kampung Ayer, where you can walk around on wooden planks that connect some of the houses. Taxis are expensive in Brunei. Most passengers partake in a cruise organized excursion. It's worth taking the boat through the nature reserve which is basically a long winding mangrove swamp. There are lots of birds, monkeys and even large snakes sleeping in the trees. You also get a decent view of the Sultan's Palace - which is colossal and looks like an airport terminal. Brunei isn’t a huge place, but outside BSB and off the main routes it’s hard to get around without a car. People drive on the left. Bandar Seri Begawan city tour: Visit the two main mosques, the Royal Regalia Building, the Brunei and Malay Technology museums, and the Sultan's Palace (1/2 day tour). Tour of Kampong Ayer (the water village): Explore by boat and on foot, the villages linked together by wooden planks and have tea and cakes in a local family's home (1/2 day tour). Nature tour: To view proboscis monkeys in their natural habitat a short distance from Bandar, and to spot flocks of white egrets returning to roost at dusk (1/2 day tour). Tour to the Jerudong area: Visit The Empire Hotel and Country Club, Jerudong Polo Club and sample some of the rides at the Jerudong amusement park (1/2 day tour). Nature tour to Selirong Island: Explore a preserved mangrove forest (1/2 day tour). The expanses of forest around Bandar Seri Begawan, particularly those located within the protective borders of Ulu Temburong National Park, make for excellent day trips. To the north of the city there are also some nice beaches, a massive amusement park, and a grand hotel that must be seen to be believed. Pantai Muara (Muara Beach) is a popular weekend retreat located 2km from Muara town, where you are docked. The sale of alcohol is forbidden so there are no bars or clubs selling booze. The local currency is Brunei dollars and cents. Brunei currency is on par with the Singapore dollar. The last is also widely accepted. The official language is Bahasa Melayu. Other languages are spoken here include English and Chinese. Free WiFi at the cruise terminal.